It’s hard to believe that Spring is almost over and summer will be on our doorstep in no time! It’s a great time to think about updating your guest bedroom in preparation for the warmer weather and those Christmas visitors! 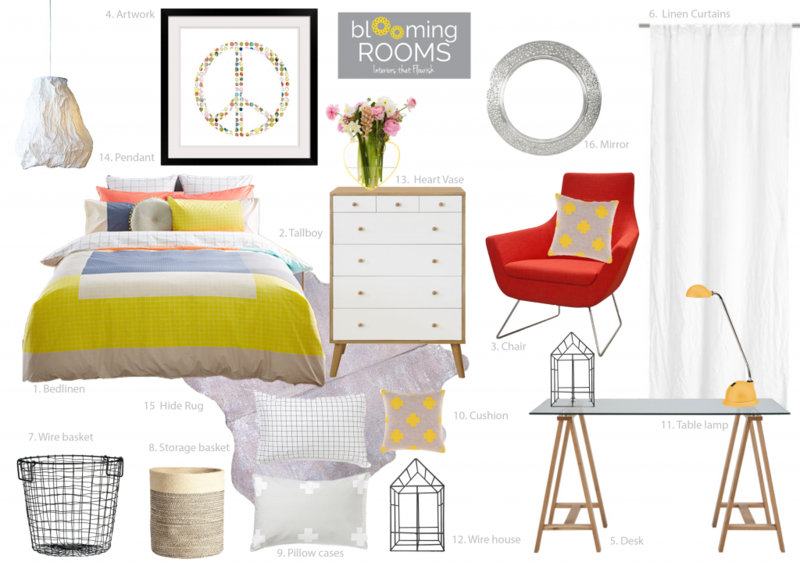 Today’s mood board does just that and provides some perfect inspiration for a bedroom update that is smart and fresh, and won’t cost the earth. The trick when using bright colours is to ensure that you balance these with some neutral greys and white to really make the colours pop. This also ensures that the resulting space is not only fun but still feels restful, relaxing and inviting as a bedroom should! We have added texture with a rug and linen curtains and some cool budget homewares to keep the room on trend. This board features 16 items ranging from $20 through to $1000 for key furniture pieces but you could also mix many of these items with existing furniture to make it a more cost effective update. If you would like some help in designing the perfect guest bedroom in preparation for your summer visitors – feel free to contact us via the enquiry form – we can quickly and easily provide a design that will have you Christmas holiday ready in no time!